All it would take is to fix the sidewalks and repair the streets that kids walk and ride as they commute to and from school. Add some refuge islands and roundabouts and streets would be safer to cross. Complement that with some speed tables and shared street design and our streets would work better for everybody. Typically, the debate over the delivery of city services comes with LA’s standard “budget crisis” excuse but in this case, there is significant federal (SRTS) and state (SR2S) funding that can be used to support children as they walk and bicycle to and from school. Safe Routes to School is administered by the California Department of Transportation (Caltrans) and there is funding to provide infrastructural improvements as well as funding to address distracted driving through education and enforcement. Programs that educate and encourage parents, teachers, administrators and students on pedestrian and cyclist safety also qualify. The City of LA is a notoriously weak performer in the competition for SRTS and SR2S funds, not only failing to qualify for its proportionate share but then defaulting when it does qualify by failing to execute the funded projects. Funded parties are given four and a half years to spend the money they qualify for or they get “red-flagged” and are suspended from further grant cycles until they clear their past projects. The City of LA spends more time arguing for extensions and exceptions than it spends simply working on the streets, enforcing the law, educating the community, and encouraging healthy and safe behavior. This bureaucratic traffic jam within the City of LA has resulted in lost revenue and a missed opportunity to reduce traffic congestion and make our streets safer for everybody. During the last funding cycle, the City of LA failed to even submit funding applications that would demonstrate a citywide commitment. As if broken sidewalks and busted streets are hard to find! In the competitive Safe Routes to School funding process, projects that come with community support do better than those that are simply proposed by traffic engineers seeking funding for routine scheduled roadway improvements. Yet the City of LA has the audacity to set a deadline for community nominations that falls on this Friday, January 20, 2012. How does the City of LA expect the community to engage in a process that offers no real opportunity for real participation? Surrounding communities (the ones that beat LA in the funding competition) have formed Safe Routes to School organizations that engage the community in ongoing campaigns that use the funding process to educate the community. 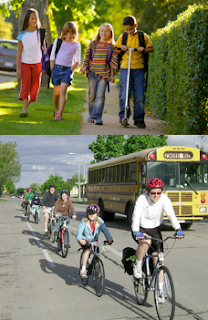 Children who walk and bicycle to school are more likely to reach the recommended goal of 60 minutes of physical activity each day, they will arrive at school energized and ready to learn, and they take an active role in their well-being. What does the City of Los Angeles have against Safe Routes to School funding and why is it so reluctant to get competitive? Last year, a group of community advocates took a Safe Routes to School project to the City of LA in search of support and a commitment to enter it into the pool of submitted projects. It was an ambitious project, one that proposed improvements to a busy arterial with four schools within walking distance. The honesty is refreshing but the revelation is contemptible. To charge the City of LA with a lackluster commitment to LA’s most vulnerable mode share, children walking and bicycling to and from school, is a harsh charge but the evidence stands. The City of LA’s infrastructure is unsafe for pedestrians and cyclists and the token gestures at improving the walkability and rideability of the neighborhoods around our schools fall far short of a commitment to our children. The City of LA’s performance in past Safe Routes to School funding cycles pales in comparison to smaller surrounding cities with smaller staffs who somehow are able to translate a real commitment to public safety into great projects. LA, on the other hand, turns in weak projects, complains about “Fair Share,” and then fails to spend the money when it eventually qualifies. The City of LA has two months to come up with innovative and inspirational projects that will not only make it safer on our streets and sidewalks, but that will also serve as an invitation to walk or to ride, improvements that encourage great behavior and bring neighborhoods together. If the City of LA is unable to come up with at least two great proposals per Council District for this coming funding cycle, perhaps it’s time to look at the Cities of San Fernando, Rancho Palos Verdes, Burbank, Covina and Claremont. What are they doing that LA isn’t doing? The City of LA has a long history of talking the talk, but when it comes to Safe Routes to School can it walk the walk? If you change the kids you change the culture. With most of those in power there is no immediate payoff for them to promote alternative ways of transportation other than the car. (So much of our local business depends on it - garages, gas stations, insurance, car dealers, used car lots etc.) And people commuting by bike or walking are not a group with huge money behind them.. If you let kids even think that they can get around with out having a car as part of their lives who will fill the garages downtown, buy the services of the automotive industry, insurance for cars, and all of the other businesses directly associated with them. LA Crime Stats: Can You Trust the Spin Doctors? Optimism, It’s Our Only Choice!